Published in Rafu Shimpo, June 17, 1957. 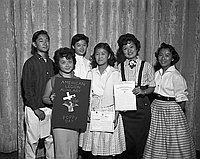 Six Berendo Junior High School students stand in front of a curtain holding American Legion awards at a special assembly in Los Angeles, California, June 14, 1957. One girl holds a poster of a basket of poppies in front of a white cross, "American Legion Auxiliary, Poppy Day." Two girls and a boy hold certificates. The Sansei are identified (left to right): Dennis Matsuura, American Legion honorable mention; Erino Shimomura, first place American Legion poppy poster contest; Helen Funai, A-9 class president and American Legion award winner; Eileen Tada, second place essay contest; Harriet Nakasone, Lady of Friendship, honorable mention; Mariann Akiyama, student body president. Typed on original negative envelope: Berendo Junior High -- 1157 South Berendo, LA.